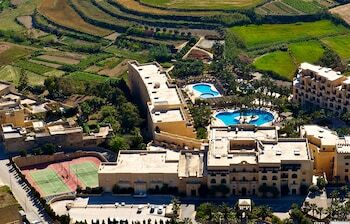 Located in San Lawrenz, Kempinski Hotel San Lawrenz is in a rural location, minutes from Ta' Dbiegi Crafts Village, and close to Gharb Folklore Museum. 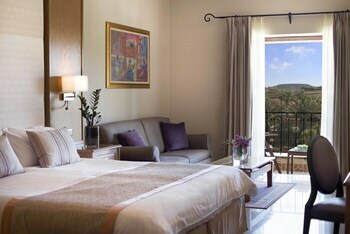 This 5-star hotel is within close proximity of Ta' Pinu Shrine and Azure Window. Make yourself at home in one of the 142 air-conditioned rooms featuring minibars. Rooms have private balconies or patios. Complimentary wireless Internet access keeps you connected, and cable programming is available for your entertainment. Private bathrooms with shower/tub combinations feature deep soaking bathtubs and complimentary toiletries. Pamper yourself with a visit to the spa, which offers massages, body treatments, and facials. You're sure to appreciate the recreational amenities, which include 2 indoor and 3 outdoor swimming pools and outdoor tennis courts. Additional features at this hotel include complimentary wireless Internet access, concierge services, and babysitting/childcare (surcharge). The complimentary beach shuttle makes getting to the surf and sand a breeze. Enjoy a meal at one of the hotel's dining establishments, which include 3 restaurants and a coffee shop/caf�. From your room, you can also access 24-hour room service. Relax with a refreshing drink from a poolside bar or one of the 2 bars/lounges. Featured amenities include a business center, express check-in, and express check-out. Event facilities at this hotel consist of a conference center and meeting rooms. Guests may use a ferry terminal shuttle for a surcharge, and free self parking is available onsite. 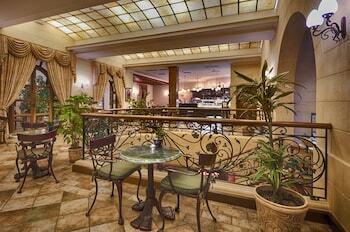 Enjoy a meal at one of the hotels dining establishments, which include 3 restaurants and a coffee shop/cafe. From your room, you can also access 24-hour room service. Relax with a refreshing drink from a poolside bar or one of the 2 bars/lounges.Kempinski The Spa has massage/treatment rooms and couples treatment room(s). Services include deep-tissue massages, hot stone massages, Thai massages, and massages. A variety of treatment therapies are provided, including Ayurvedic and reflexology. The spa is equipped with Turkish bath/hammam. This property offers transfers from the ferry terminal (surcharges may apply). Guests must contact the property with arrival details 24 hours prior to arrival, using the contact information on the booking confirmation. 3 outdoor swimming pools and 2 indoor swimming pools are on site. In addition to a childrens pool, other recreational amenities include outdoor tennis courts, a spa tub, a steam room, and a fitness center.